248 p., 14,7 x 20,8 cm. With contributions by Fred Busch, Joachim F. Danckwardt, H. Shmuel Erlich, Mira Erlich-Ginor, Claudia Frank, Eberhard Th. Haas, Helmut Hinz, Christine Kirchhoff, Elfriede Löchel, Cordelia Schmidt-Hellerau and Christoph Türcke. Since Freud introduced the concept of a death drive in 1920, it seems to have influenced the intense discussion about the phenomena which Freud attempted to express with this. On the one hand, his ideas on this have been expanded and rendered clinically productive, and on the other hand they have been rejected, or in other words a different understanding of repetition compulsion was developed in comparison to that of Freud. 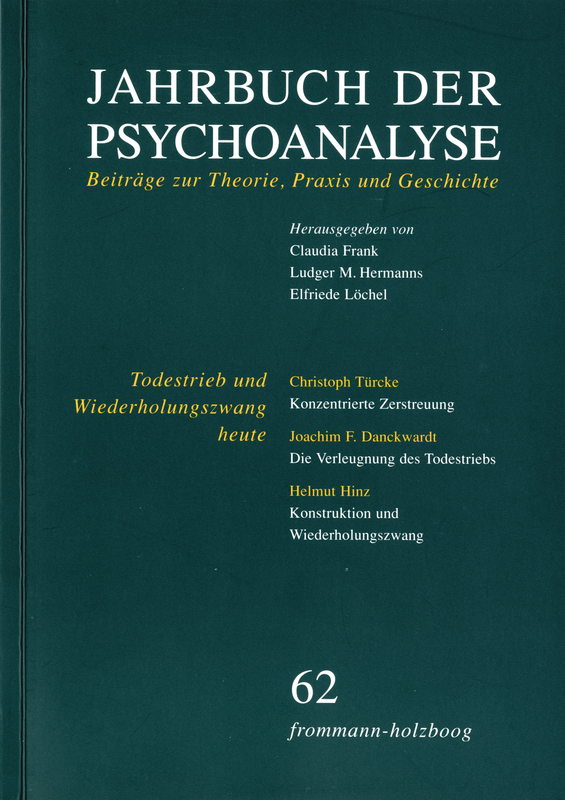 This volume sheds light on aspects of the current discussion from various perspectives, for example that of the philosopher C. Türcke, the winner of the Sigmund Freud Cultural Award in 2009 as well as that of the psychoanalyst J. Danckwardt, whose Wolfgang Loch lecture given at the presentation of the Wolfgang Loch Prize in 2010 is reprinted in this volume. Whereas the focus is on theoretical issues in the articles written by E. Löchel and C. Kirchhoff, clinical issues are also in discussed in the articles written by H. Hinz and C. Frank on the basis of case studies. The volume also includes an essay on C. Türcke’s last book, written by E. Th. Haas, as well as the Karl Abraham lecture by F. Busch. Any rituals, customs, grammatics, laws, institutions result from traumatic repetition compulsion. Up until the beginning of modern times repetition meant de-escalation and reassuring. The mechanical processes of repetition, especially those of picture-machines, have a re-escalating effect, they put the human sensorium under permanent agitation and create an attention-deficit-culture, which is about to take back one of the great achievements of mankind: the distinction between perception and illusion. The present article is a commentary on Christoph Tuercke’s paper »Concentrated Distraction«. The commentary questions two contentions: firstly, the idea of traumatic compulsion to repeat as the main source of culture; secondly, the idea of a contemporary derangement of culture and nerves due to microelectronic technology. The article emphasizes differences between Tuercke’s cultural philosophical method of thinking and psychoanalytic methods of thinking. One of the main differences is conflict as the leading idea as opposed to monistic principles of explanation. This difference is maintained in relation to Tuercke’s phylogenetic hypothesis as well as his hypothesis on today’s subjects being diagnosed as carriers of ADD. It is also maintained, that conflict as principle does hold not only in relation to the object of psychoanalytic knowledge, but also, self-reflecting, in respect to the methods of gaining knowledge. The article suggests to investigate the subjective meanings of microelectronic technology by psychoanalytic research methods. The repetition compulsion of the analysand which is realised by the intrusive action potential of projective identification leads to extremely resistant relational patterns and is thus a basic way for the patient to anchor in his world. It is his way to structure his world or his relationships. These patterns correspond with archaic relational phantasies (constructions of relationships). They can be substituted by constructions with a higher degree of freedom, if the analyst is successful in bringing to consciousness these at first unconsciously repeated action patterns in the process of interpreting. An interpretation or construction has the power to bring about psychic change if compatible with the experience made in the actual experience of the repeated archaic phantasy and if compatible with the actual practical needs of his life. The clinical example shows a form of involvement and the way to such a compatible interpretation, which, in a first step, helped to get out of an analytical impasse. Taking the often hot and fruitless disputes about the value of the concept of a death drive as the starting point of her paper the author brings up the idea in how far they could simultaneously reveal as much as defend the very phenomenon one tries to grasp with the concept. Perhaps one has to struggle again and again to think about it in an adequate form. She then discusses different facets which S. Freud described in connection with the death drive – undo connections and thereby destroy things; addiction to destruction; to bring Eros, its antagonist, into play against it – in their clincal meaning as elaborated by M. Klein and her followers. Finally, she demonstrates with the help of a clinical example a critiqueaddiction as a form of an addiction to destruction. The Freudian concepts of the unconscious wish and death drive are interpreted as corresponding concepts. Based on close reading this article argues, that the invention of death drive in Freud’s late writings should be seen as the return of the unconscious wish that can be found in his early writings like the ›Project for a Scientific Psychology‹ and the ›Interpretation of Dreams‹. While the concept of unconscious wish focuses on the productive power of the interaction of wish and inhibition as Freud puts it in his construction of constitution of subjectivity, death drive seems to be a purely destructive power. The return of unconscious wish as death drive is seen as an example of afterwardsness in theory building. When it comes to the question of whether unconscious wish returns as death drive, Freud’s writings related to World War One show that the cultural and social conditions have to be taken into consideration. Both levels are affected: theory building and constitution of subjectivity. On the basis of her revised drive theory, briefly sketched in this paper, the author shows that the symptoms of a negative therapeutic reaction – when the patient gets worse again after having made progress in the analysis – present a necessary transitional phase on the way towards a healthy representation of self-preservation. Illness and the fear of becoming ill do not show a resistance against getting better but are first signs of progress, indicating that the traumatized patient with a deadened part of his self does care again about his well being. The unconscious sense of guilt that Freud recognized at the bottom of the negative therapeutic reaction is a denial against the overwhelming helplessness of the traumatic situation. The anxiety in the negative therapeutic reaction is stirred by this helplessness and the relating rage that threatens to catastrophically destroy the individual’s most needed objects. The paper is part of a research project on ›Sigmund Freud’s implicit psychoanalytic theories‹. The historical survey is followed by the presentation of unjoint parts of theory dating before and after the life-death-instinct-hypothesis developed in ›Beyond the Pleasure Principle‹ in 1920. It shows how far-reaching Freud had further developed the hypothesis. On the one hand as a conditio humana, the successful ability of saying yes and no; on the other hand as a damage of the dual drive-system and its consequences. The insufficient adoption of the developments had led to the denial of the death instinct and has contributed to the still lasting controversies. A meta-analysis of Bion’s case-study »On Arrogance« displays the development by Klein and Bion from the point where Freud had already arrived at: the necessary development of splitting, projection, and projective identification as essential forms of communication. Together with these the development of symbol-systems takes place. The ›No‹ can establish itself from a specific extinguishing action to a hallucinatory-scenic form of symbol by using pictorial contrast-ideas as to be found in dream-work; it then proceeds to the performative-gestural and arrives finally at the semantic ›No‹. Bion’s vignette shows the meaning of the life-death-instinct-hypothesis for understanding how normal people become culprits and for understanding mental cruelty as well as how to treat such personality disorders psychoanalytically. What do we hope our patients have developed at the end of a »good enough« psychoanalysis? It is the thesis of this paper that the process of knowing is as important as what is known from psychoanalysis. What is accomplished in a relatively successful psychoanalysis is a way of knowing, and not simply knowing. In this paper the term »process knowledge« is introduced to highlight a particular way of analyzing that centers on how our patients gain knowledge. It is suggested that analyzing with heightened awareness to process knowledge is crucial for the patients’ capacity for self-analysis, and differs from helping patients primarily gain knowledge of their unconscious fantasies and conflicts as the primary curative factor in psychoanalysis. In July 2007, the International Psychoanalytic Congress convened for the first time since the war in the former Nazi capital, Berlin. An open large group forum was held at this meeting, where attendees (Jewish, German and others) had the opportunity to explore the emotional aspects stirred up by being in Berlin. Hundreds of people participated in the event and described it as the ›heart of the Congress‹. We examine several aspects of the event, including the passions stirred, the containment of the setting, and the voices present and absent. It was approximately one hundred years ago when Albert Schweitzer came to the conclusion that modern theology had produced a strangely lifeless Jesus. Friedrich Nietzsche warned even earlier that historical dissection, applied to religion, could destroy it. True history had to serve life and it had to include historical figures and events in such a way that they have an influence on the present and develop their power. Türcke’s attempt to read the New Testament as a manifest dream and to advance to the underlying latent dream thoughts via own interpretations and historical-critical research, is reviewed with regard to its validity. His remarks about the Easter event, trying to get along without the concept of mourning, contribute considerably to the image of an undead Jesus. Even the excursion about the apostle Paul is not suitable for bringing to life the image of the beginnings of Christianity. In his psychoanalysis of the New Testament Türcke dissociates himself from Freud’s explanations in his cultural-theoretical writings. His anthropology represents important and new views, but refuses the connection to the drafts of Freud or other authors offering a general theory of religion. In the chapters on the Sermon on the Mount, the parable speeches, and the command to love enemies, the reader meets however a more vivid image of Jesus that makes comprehensible why the New Testament has still today not lost its challenge.